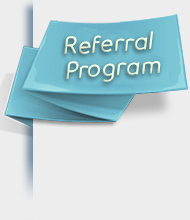 You will receive $10 referral bonus when your friend signed up our long distance service. The bonus will be credited to your account in 2 separate months of $5 each, when your friend's long distance usage is more than $10 in those months. You will receive $10 referral bonus when your friend signed up our Internet Plan; the bonus will be credited to your account on the 2nd month after activation of service. You will receive $10 referral bonus when your friend signed up for one year Digital Phone Service; the bonus will be credited to your account on the 2nd month after activation of service. 1.The easiest way is to get a Personal Link via our Promotional Referral Email, copy and forward the link to your friends via texting, email, Facebook, Twitter, WhatsApp, WeChat etc., your account will be recorded for the referral bonus. 2.Call our customer service hot line 1-877-513-3087 to give us your friend's names and phone numbers. Our customer service representatives will contact them for registration. 3.Let your friends call our customer service hot line 1-877-513-3087 for registration and you should remind them to mention that they are referred by you. 4.Enter and submit your friend's names, phone numbers below, our customer service representatives will contact them for registration.